Acute scarcity of river sand in Tamil Nadu has brought real estate activities to a standstill, delaying construction of ongoing projects across the State. While a few small-scale developers have parked their projects, others have opted for substitutes such as gypsum and M-sand. The Central Government announced a 274-km long green expressway corridor between Salem and Chennai at an estimated cost of Rs 10,000 crore. The proposed expressway will reduce travel time between two cities to three hours from the present six hours. Tenders will be floated in Q2 2018. Tamil Nadu government proposed three metro rail corridors covering 107 km under Chennai Metro Phase 2. The first phase of the project will cover two routes - Madhavaram to Chennai Mofussil Bus Terminus (15 km) and Madhavaram to Sholinganallur (35 km). In another development, CMRL began trial run on an underground 4-km stretch from Saidapet to AG-DMS. State government sanctioned Rs 200 crore for the first phase of Chennai Peripheral Road, connecting Ennore Port with Thatchur. The 129-km long corridor is aimed at decongesting northern section of the Chennai Industrial Corridor. Under PMAY, Tamil Nadu slum clearance board has proposed to develop 3,000 houses at Manali New Town to accommodate slum dwellers in North Chennai. Till now, around 288 slum dwellers have already been allotted houses. 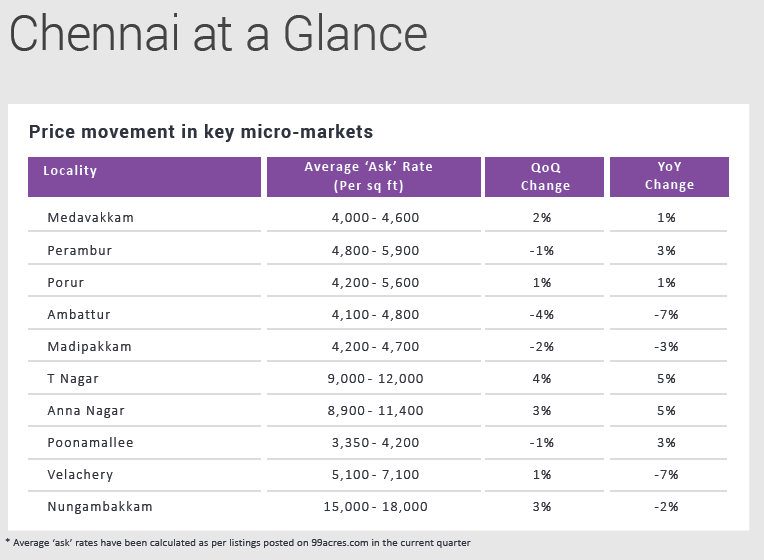 Chennai’s realty market remained stagnant with meek sales volume and nearly no new launches in the first quarter of 2018. A slight increase in demand for under-construction properties hints towards a revival in the otherwise tepid investor sentiment. The commencement of the AG-DMS-Saidapet metro corridor is expected to boost traction in the adjoining localities of Anna Nagar, Mogappair, Ashok Nagar and Ekkaduthangal, as the stretch would ease commuting between Washermenpet and the Chennai airport. The slow registration process of residential projects under Tamil Nadu Real Estate (Regulation and Development) Act (TNRERA) and inefficient online property approval system are proving to be hindrances to the smooth functioning of real estate activities State-wide. Till now, only 380 projects across the State have been successfully registered under the Act. The completion of long-awaited bridges at Porur and Thirumangalam have spread some cheer in the market. The enhancement has majorly benefitted the secondary market with these locations already witnessing improved demand from end-users. The forthcoming quarters are speculated to reap the benefits of the proposed infrastructural enhancements. Sales volume, however, is expected to maintain status quo due to a handful of new launches. The number could improve, provided the existing leakages in TNRERA are plugged. In line with the previous quarters, Jan-Mar 2018 remained testimony to fewer launches, truncated sales volume and negligible price movement. While developers continued to struggle with the ambiguous norms of the Real Estate Act, prospective buyers abstained from entering the market. Political instability and inefficient implementation of RERA and the online property registration system, continued to cast their shadows on Chennai’s realty market in Jan-Mar 2018. As a result, the city failed to post any notable hike in average weighted capital ‘asks’ in the current quarter. Well-developed housing belts remained popular amongst buyers. While Adyar topped the capital charts with a four percent jump in average property prices, Medavakkam posted a two percent hike, QoQ. The localities are favoured owing to their proximity to Old Mahabalipuram Road (OMR) and the IT hub, Velachery, where prices have gone beyond affordable. The penchant for seamlessly connected areas was visible with Tambaram in South Chennai posting a three percent hike in capital prices, QoQ. In addition to having a plush residential and commercial inventory across budget segments, it is witnessing a comprehensive infrastructural expansion. The development of Tambaram Railway Station as a terminal, catering to the Southern Tamil Nadu bound trains, has helped its case. The factors also led the locality to register a five percent upward tick in rental prices, YoY. The industrial district, Guindy, witnessed property prices firming by two percent in the current quarter. Its comparative affordability to the neighbouring Saidapet, Adyar and Velachery ensured buyer traction. Metro connectivity coupled with the newly completed Kathipara flyover worked as a growth catalyst for the locality. Ambattur in the West and Madipakkam in the South witnessed capital prices slipping by two to four percent, QoQ. Stiff completion amongst multiple new projects under different stages of completion led developers to revise ‘ask’ rates in order to lure buyers. The subdued capital market benefitted the rental landscape where average prices bolstered by two percent between Jan-Mar 2018 and Jan-Mar 2017. Affordability remained a major attraction for the price-conscious tenant community in Chennai. Located along NH-4 and offering competitively-priced rental inventory, Oragadam witnessed a leap of 10 percent in rents, YoY. Vandalur, another pocket-friendly locale, recorded a similar rental hike on the back of smooth road and rail connectivity. 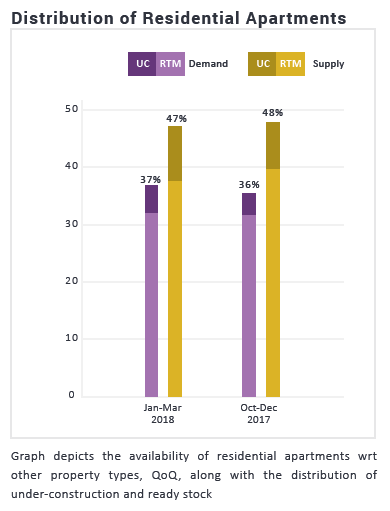 After several quarters of subdued demand for under-construction units, the category regained buyer interest, albeit by a small margin, in the quarter ending March 2018. The minimal upward movement indicates homebuyers’ improving confidence in the segment, partially driven by the formation of TNRERA. New supply remained constricted across Chennai. While demand for under-construction units witnessed a marginal hike in the current quarter against Oct-Dec 2017; supply inched by three percent, as owners made attempts to disinvest their realty investments. The affordable and mid-income housing segments (within Rs 40 lakh) remained the most popular amongst buyers. The budget category accounted for more than half of the overall housing demand in the city. However, supply remained lower this quarter, too. The demand-supply gap in the under Rs 25 lakh housing segment slumped by two percent, standing at 12 percent in Jan-Mar 2018. The gap has condensed by three percent, YoY. Supply of units priced between Rs 40 lakh and Rs 60 lakh surpassed demand by three percent. Surplus inventory in the most popular budget bracket relays negotiation power in the hands of the buyer. The high-income segment (Rs 60 lakh – Rs 1 crore) saw supply exceeding demand by 12 percent, QoQ. Ultra-luxury housing category (above Rs 2 crore) witnessed a borderline disequilibrium in demand-supply this quarter.